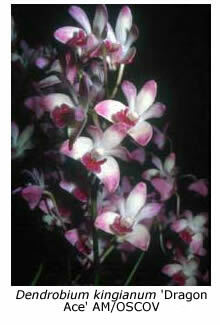 There are so many orchid species that flower in spring that it is difficult to decide which to include here. All of the ones I have chosen may be grown in a shade house, although Encyclia polybulbon and Maxillaria grandiflora may do a little better with winter warmth. Coelogyne cristata deserves a place in every orchid collection. Grown in a hanging basket where it receives good light and air circulation, it flowers reliably each spring. It should be watered heavily when in active growth but much less frequently during winter. I find that divisions re-establish themselves much more quickly is chopped Sphagnum moss is added to the pine bark potting mix. The crystalline, white flowers last much longer if kept dry. 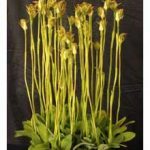 Cymbidium hookerianum is the first of two cymbidium species that I have chosen for this series of articles. It has large, glossy green flowers measuring up to 125 mm across on a largely pendulous inflorescence. It is much less common in cultivation than Cymbidium tracyanum or C. lowianum (see following article). By contrast, Dendrobium kingianum is by far the most common of all the Australian native dendrobium species in most collections. 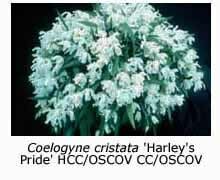 It is a highly variable species, both in terms of plant size and flower colour. 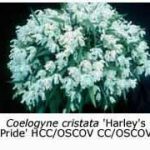 Canes may vary in length from 50 mm to 500 mm, while flower colour ranges from white through various shades of pink to purplish red. Some cultivars are white with a purple lip (the so-called variety Silcockii), while others are speckled or striped. In nature, Dendrobium kingianum grows as a lithophyte, and I therefore use a potting mix containing both pine bark and river pebbles. Dendrochilum glumaceum is one of the few dendrochilums that I have grown in a shade-house as well as in a heated glasshouse. It perhaps does a little better with warmth but gives quite satisfactory results in a ‘cosy’ shade house. The inflorescences emerge from the centre of the new growths and carry up to a hundred straw-coloured flowers, each with an orange lip. Encyclia polybulbon, also known as Epidendrum polybulbon and Dinema polybulbon, is a miniature species found in Mexico and Guatemala at altitudes up to 2000 m, and is therefore amenable to shade-house cultivation in Melbourne. The plant branches freely, so that it covers its host (a piece of tree fern or cork bark) within a few years. The solitary flowers are yellow with a white lip, and are borne from the apex of each recently matured growth in spring. Plants flower a little earlier if grown in a heated glasshouse. 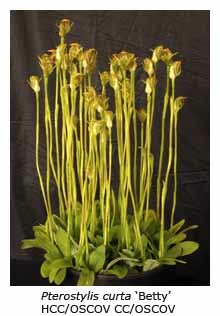 Pterostylis curta is just one of a number of Australian native greenhood orchids that flower in winter and spring. Many are easy to grow and multiply prolifically if provided with suitable conditions. 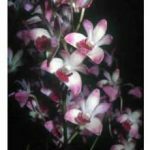 The potting mix is all-important and potential growers can do no better than follow the recommendations of the Australasian Native Orchid Society, as outlined in their publication Cultivation of Australian Native Orchids. Sophronitis coccinea is the best known of seven miniature species in the genus Sophronitis, which is found only in Brazil. It grows on rocks and low shrubs on mountaintops, where it is exposed to high light, strong winds and relatively low temperatures. I believe that the secret to growing this species well is to provide it with good light, while keeping it cool during summer – rather a difficult undertaking in hot weather. If you can provide the conditions that suit this species, its bright red flowers will provide a welcome splash of colour in your shade-house for weeks.